Awesome local bakery! 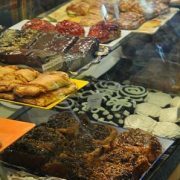 Whether you are looking for a sweet treat or a hearty sandwich and cup of soup, you can’t make a bad choice here. They also have a selection of ice cream which hits the spot on a hot summer day. With it’s central location, The Bakery is a great spot for breakfast and lunch, as well as a welcoming hang-out between meals. It is an easy walk (about 1/4 mile) from this cabin. Great place to go for dinner! The Ranch serves up some great home cooked meals in a friendly and laid back atmosphere. Reservations are required. Check out their menu and make reservations here. Stehekin Valley Ranch is located 7 miles up-valley from this cabin. 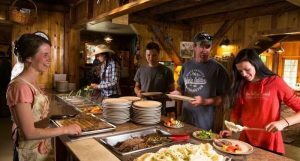 The Lodge serves all three meals and is located at the Stehekin Landing. Reservations are required for dinner.